A man from Ruislip has been charged with burglary and possessing a knife after being caught up in one of the incidents of vandalism and theft that broke out in the borough last week. A Curry’s store window was smashed and 12 men were arrested in connection with looting at Argos in Victoria Retail Park, South Ruislip, on Monday. Faroud Deousti, 21, of Linden Avenue, was among those facing the courts, charged with two counts of burglary and possession of a knife; it has not yet been confirmed if his arrest related to Ruislip or an incident elsewhere. A report from Hillingdon Police said that the men who were arrested for looting Argos were taken to Maidenhead police station and are being processed by Thames Valley Police. Some councillors have called for any council tenants caught up in the violence to be evicted from their homes. Additional reporting: Gaz Corfield (current liveblog), Ricky Compton (liveblog prior to 17:30 and now Twitter @thewestlondoner), Xenia Coudrille (Facebook page), Lee Fleming (research), Chris Green (research), Sean Cameron (ground reporting & research) and Moa Aarenstrup (late night research). 0325: We’re knocking off – third day of doing this and it’s taking it’s toll. Nothing new coming in London now. Will do a roundup of the day’s events when we wake up tomorrow. We’ll end the day with a few words from Deputy Assistant Commissioner Steve Kavanagh of the Metropolitan Police. Goodnight and stay safe. 0323: BBC apparently confirming the Dudley story. Last reports – unconfirmed – that two or possibly three people were hit by a car which appeared to have been driven at them deliberately. Sangat TV, non-English reporters on a Sky channel, are saying that two men died. We have no way of confirming that at this time though. 0316: Nothing more on Silver Street in Enfield. 0314: VIDEO: People chasing alleged looters in Enfield earlier today. We’ll leave you to form your own opinions on the content of the video, if you wish. 0310: Earlier rumours of fire in Holloway unconfirmed – a car may have been set alight an hour ago but we can’t be sure. Checking reports of something in Silver Street now. 0302: Sangat TV on Sky are reporting two people dead in Dudley, Birmingham – this seems connected with the road traffic incident of earlier. Possibly a deliberate hit and run but that isn’t confirmed yet. 0300: We’re going to knock off at 0315 – London is quiet now and we’re exhausted. Any fresh updates to @thewestlondoner and @gazthejourno if you have them. 0250: Silence all round. Waiting on rumours from Dudley. More reports of disturbances in Gloucester too now. 0243: Hounslow fire is most definitely out. 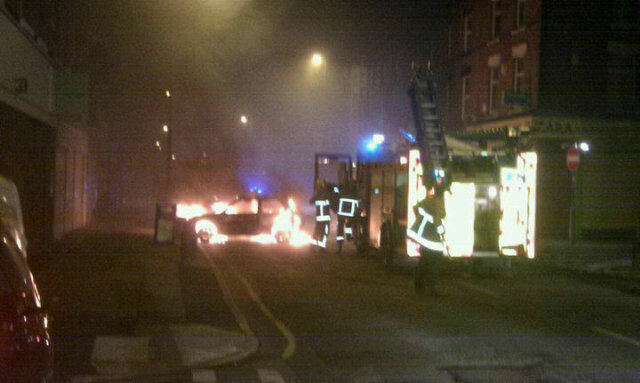 Meanwhile the burnt out car in Lawrence Road, Liverpool, apparently belongs to a naval officer. 0240: Verifying reports from Dudley/Birmingham. Thamesmead has gone quiet – hopefully the arsonists there have given up. 0235: Police in Dudley have released a statement referring to three men being injured in a road accident and taken to hospital. Nothing about a death, but we’re looking into it – eyewitnesses claimed someone was killed. 0233: Fresh reports that the Thamesmead fires are cars, not houses. 0230: Updates slowing because we’re getting lots of unconfirmed rumours in, trying to verify. Reports of a possible death in Birmingham, working on that. Thamesmead has gone quiet – Hounslow fire is out – Liverpool reports just vehicle and business premises fires, no fires in residential areas. 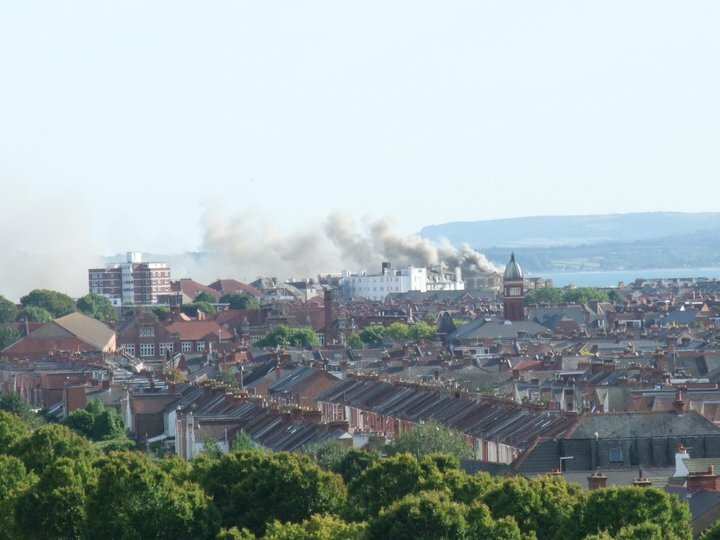 0211: Eight fire engines attending large blaze in Brunswick Road, Gloucester, reports Sky News. Still looking out for more info on Thamesmead arsonists and Enfield situation. 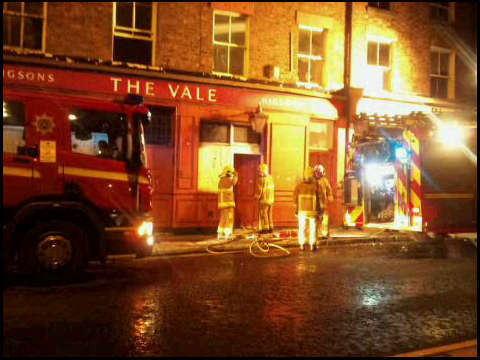 Thames Valley Police in Reading reporting a fire in London Road, Reading. 0206: Reports now that arsonists in Thamesmead may be near a primary school. Obviously the school is empty and the reports are not confirmed, but we’re working on it. 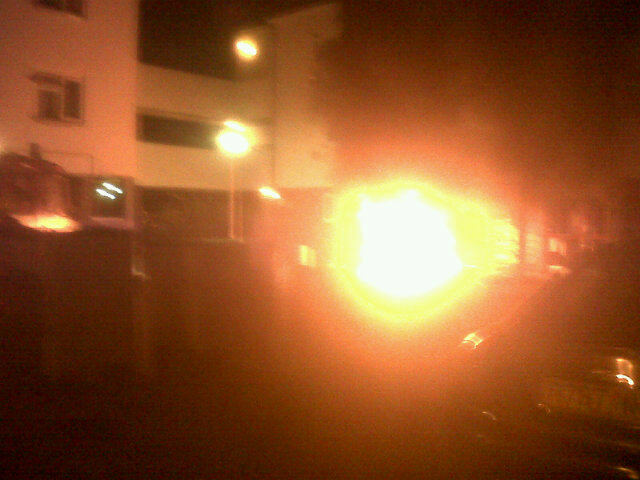 0204: Unconfirmed reports that the arsonists in Thamesmead are mobile and moving towards the town centre there. Near Crossway Gym. 0201: Houses near Linton Mead (Thamesmead area) are apparently on fire. Confirming. 0156: Reports that Thamesmead is suffering from arsonists – stand by. 0155: More from Liverpool: 2 fire engines and police car hit by missiles in Lawrence Road (see 0128 update) but none of the officers were injured. 0150: Our Liverpool man, Alex Mitchell, is clocking off – no more news from there for the moment. 0146: Unconfirmed report from Camden that someone has set fire to a pile of rubbish. Looking for confirmation. 0140: Calm in London now, unless you know otherwise. Tweet us – @gazthejourno and @thewestlondoner. 0132: Police have arrested four people in Borough Road, Birkenhead, for conspiracy to commit criminal damage. 0129: Peter Beaumont on the ground near the Park View Road fire is reporting that the fire brigade have attended and extinguished the flames. Police are continuing to patrol. That was quick! 0128: Picture from Lawrence Road, Liverpool, about an hour ago. 0126: Recycling depot at Park View Road apparently handles general waste including cooking oil and used engine oil – possibly some of that which is fuelling the flames? 0124: Park View Road is the rubbish lorry depot – separate reports coming in of something to do with a “diesel depot” according to BBC. Confirming. 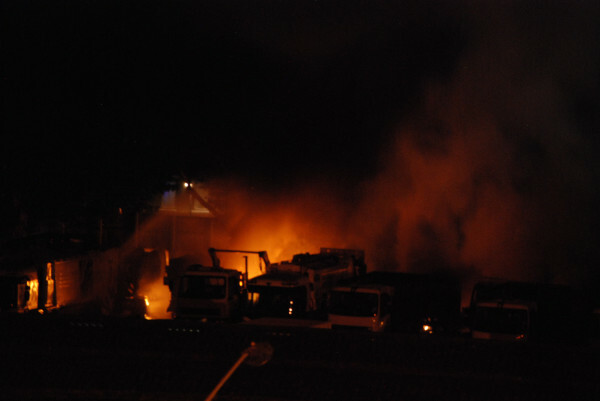 0121: Three explosions reported at Tottenham rubbish lorry depot. 0120: Birkenhead pub just now. Merseyside police say to avoid Park Road South in Birkenhead. 0117: Fire engines seen heading towards the Tottenham rubbish lorry depot. Finding official name/address of the depot now to avoid confusion. 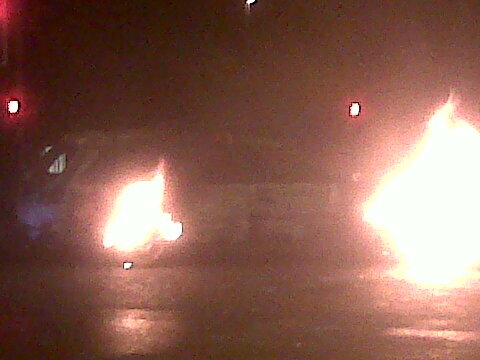 0113: Car on fire in Bordesley Green, Birmingham, courtesy of Paul Lewis of the Guardian. 0110: Council rubbish lorries on fire in Tottenham – sparks reportedly 200 feet high there now. 0107: Peter Beaumont of The Observer (there’s a newspaper you don’t hear about often) is on the spot in Tottenham; there is a fire at the council recycling depot there. Explosion not long ago, may have been a fuel tank of some description. 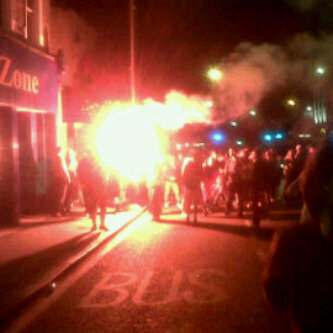 0105: Fire in Tottenham, possibly riot-related. 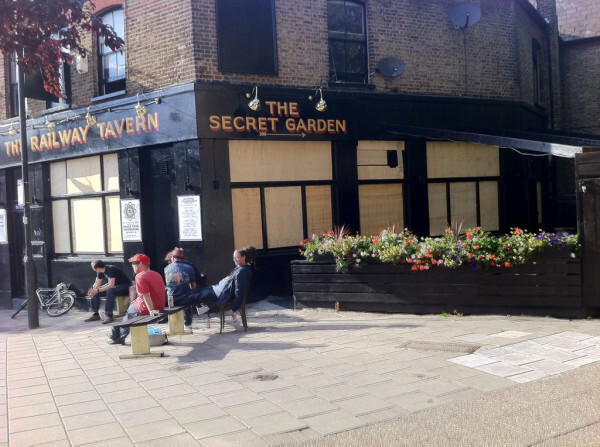 Checking now, seems to be in N17. 0101: Reports from Matt Holehouse of the Daily Telegraph that there are disturbances at Feltham Young Offenders’ Institute. Prison service are apparently dispatching extra vans. 0058: Latest from St Albans is that two people set fire to a bin earlier. Not riot-related so we’ll say that all is calm there. 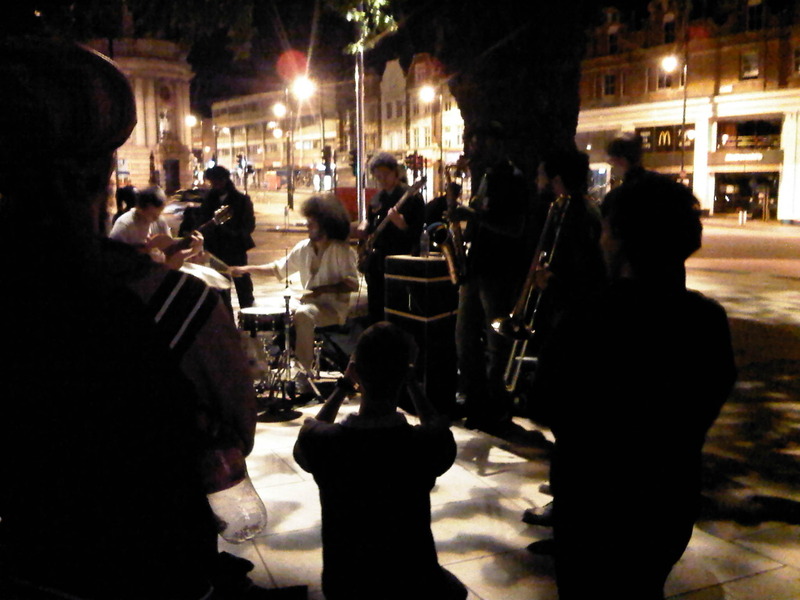 0054: VIDEO: Street band United Vibrations playing on the street in Brixton – from Arjun on the ground there. (external link to TinyPic). 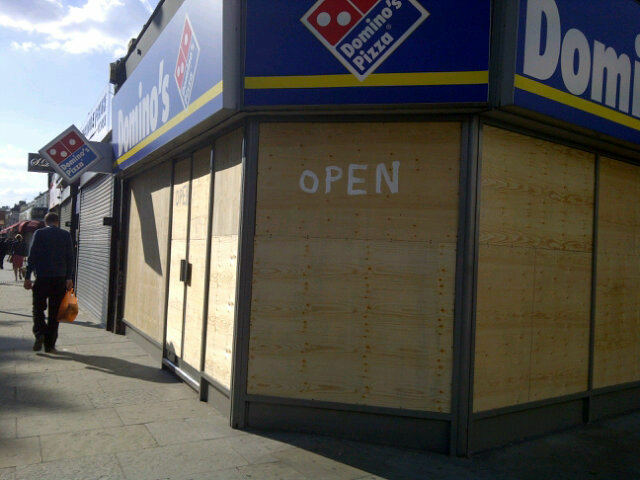 0053: Shops already being repaired in Manchester, seems to have calmed down there too. 0051: Police confirming reports of damage to shops in Birkenhead and some fires there too. Looking for more details. 0047: Picture from Tesco Express in Hayes just now. Police already on scene, nothing more to report from there. 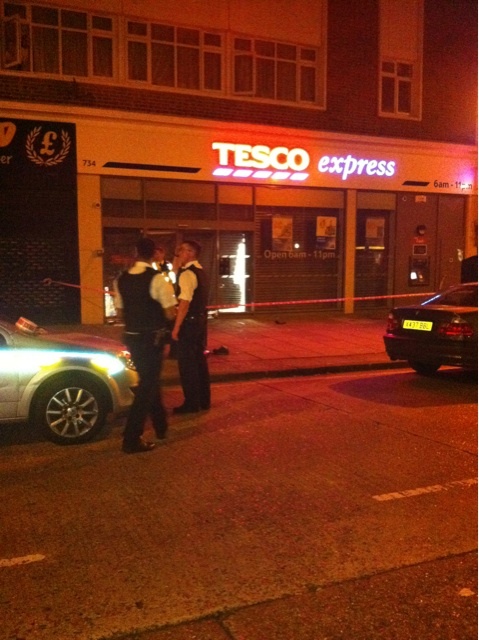 0044: Tesco Express in Hayes was apparently hit by ram raiders – doesn’t appear to be riot related at all. Picture of a BMW minus its front numberplate going around but no solid confirmation just yet. 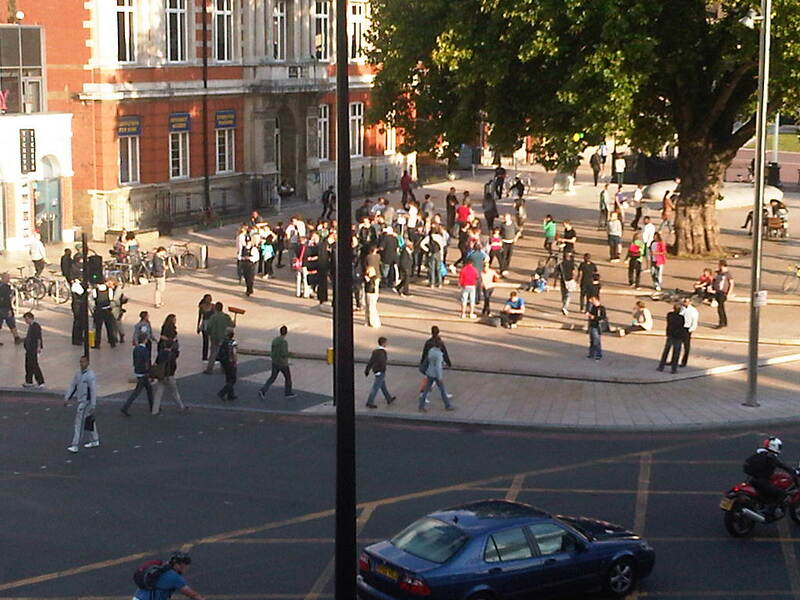 0041: Interesting photo of a jazz band in Brixton from our man on the ground there. 0040: Two of our researchers have just gone to bed (they have day jobs, lucky sods) so updates may slow. Tweet @gazthejourno and @thewestlondoner if you have more info. 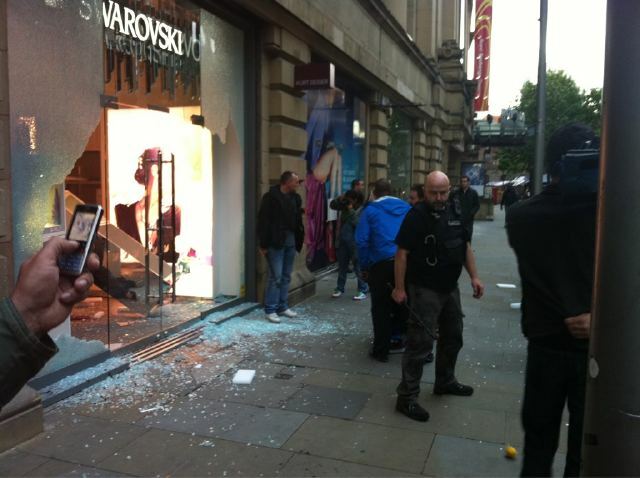 0037: Rioters are trying to break into a Jessop’s camera shop in Manchester. Reports that Greggs has been targeted. 0035: VIDEO: Police vehicles driving slowly through Enfield. No reports of anything except curious crowds there now. 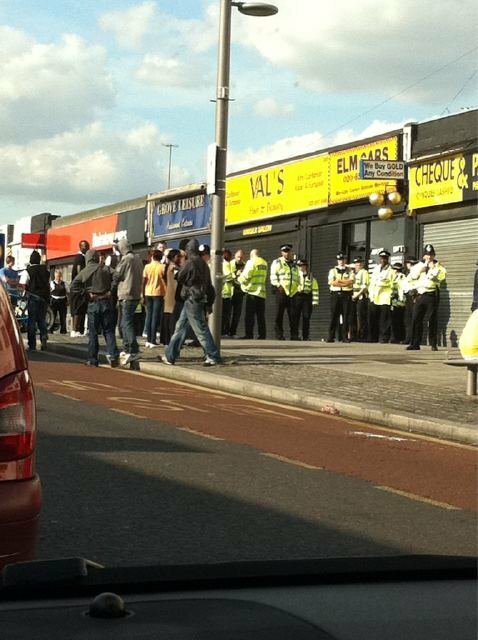 0033: Asda in Toxteth (Liverpool) reports a breakin but police are on the scene. 0030: Not much more known on Slough. Updates will pause for a few minutes – confirming some info on Manchester. 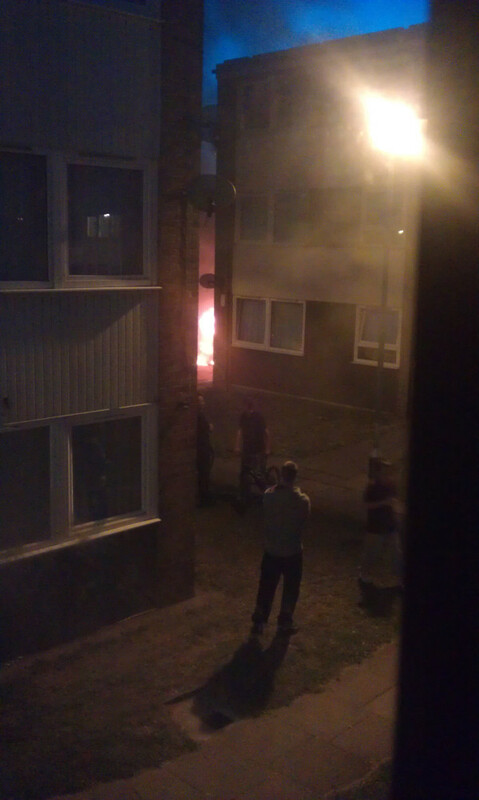 0027: Crayford fire is apparently domestic, nothing to do with rioters it seems. After that burst of reports it really does seem to be quietening down across London. 0022: Enfield Town. Lots of police, not much disorder it seems. 0019: Starbucks in Slough a few minutes ago. Smashed window – nothing more known yet. 0017: Kensington is reported to be calm. 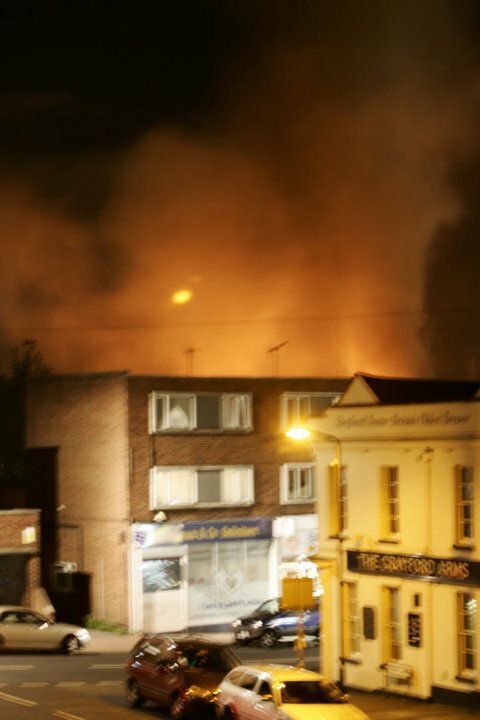 Don’t know anything more about the Crayford fire – I can tell you that there was a fire, and now there isn’t a fire. 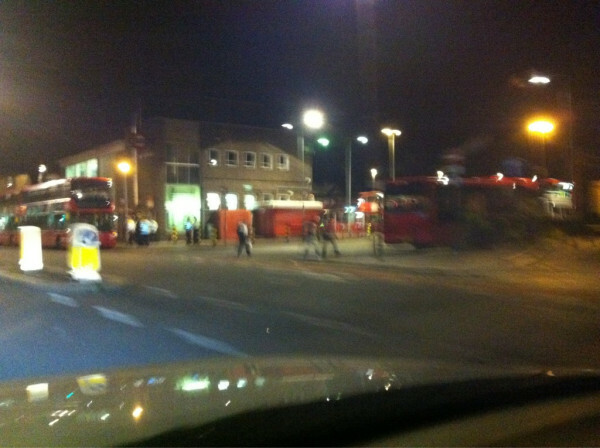 0016: Crayford – apparently the fire service have extinguished the fire there. Swift action! 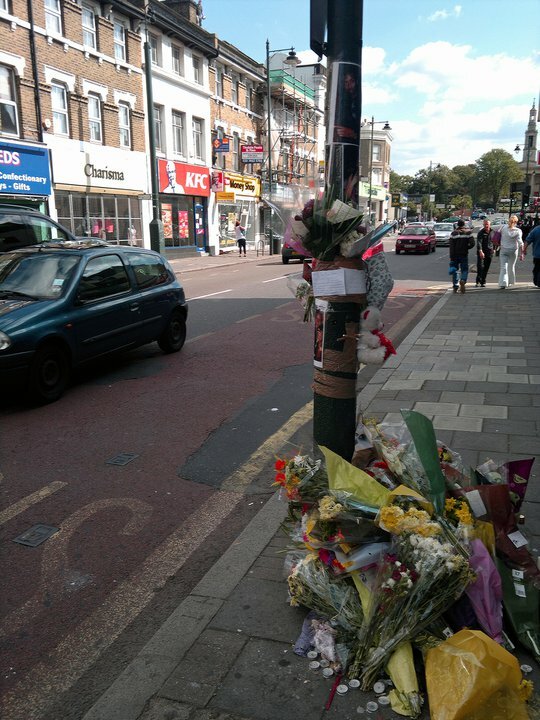 0015: Brentford update – people are saying it’s peaceful there. 0010: Billy Kember of the Times reporting that crowds in Enfield are melting back into the pubs. Seems to have been a brief flash, nothing more. Hayes skip fire unconfirmed. 0008: Gang of 40 reported in Slough just now. Confirming that. 0006: Lombardy Retail Park in Hayes reportedly quiet now. Confirming location of those skips reported earlier. 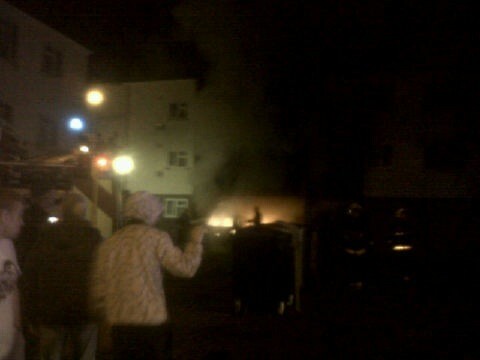 0003: Skips being set alight in Hayes now. 2358: More reports coming in from Enfield station – checking now. Hayes still unclear. 2357: Rumours coming in of a possible fire at Hayes Lombardy. 2354: Sky News reporting objects being thrown at police in Liverpool. 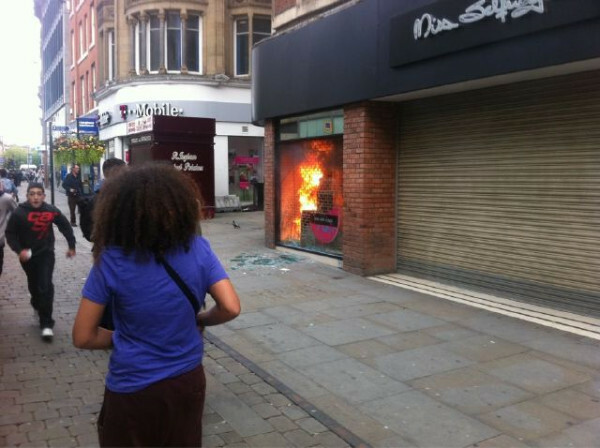 2350: VIDEO: Miss Selfridge in Manchester on fire, courtesy of ITV/Granada. 2346: Tulse Hill, Dulwich, Streatham and Norwood all calm. London seems to be cooling down. At this rate we might get to sleep by 2am! 2344: VIDEO: Eltham earlier this evening (YouTube external link). 2336: Brentford seemingly quiet. Some sirens but it’s likely that whereever there’s trouble in London police will be moving there. Sirens on their own don’t mean trouble in your area! 2332: Helicopters reported to be near Mitcham and Wimbledon. Nothing reported on the ground, so no cause for alarm down there. 2329: Old stuff coming in from Eltham indicates that there was a fairly large crowd with police there. Still checking for latest on situation there. 2315: Reports from Birmingham suggest that the city has been locked down and things are getting calmer there. 2314: Brixton reports that all is quiet except for the residents’ cleanup operation there. 2311: Five people in Watford have been arrested for criminal damage. Canning Circus fire in Nottingham – latest there is that the fire has been extinguished and police are preserving the scene for forensic evidence. Eight arrested there. 2310: Slight technical difficulties at our end. 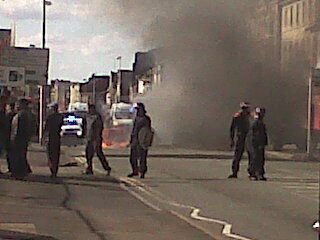 Manchester and Nottingham both report police still clashing with rioters. 15 arrests in Salford. Greenford (London) is quiet. 2302: Dagenham, Uxbridge, West Drayton and Ruislip all quiet, despite rumours. 2259: Lewisham High Street reportedly quiet, as are Burnt Oak and Greenford. 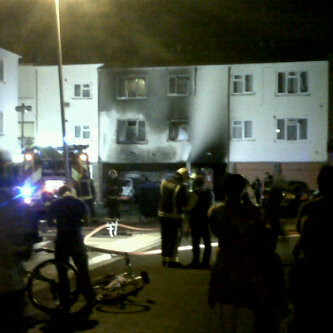 2254: Burnt Oak update: the cars that were apparently burning there have been extinguished. 2248: Huge amount of rumours going around about Lewisham. I am going to downgrade our reports to UNCONFIRMED because all verifiable reports from people living there say it’s peaceful at the moment. Eltham situation fluid. 2246: VIDEO from Seven Sisters. External link to yfrog – it is on its side, unfortunately. 2243: BBC News live reporting from Manchester behind riot police now. 2236: Seven Sisters Hair and Beauty is reportedly on fire. The fire in Southend was on the Leigh industrial estate (link to local paper), very close to Big Yellow Storage. 2231: Big Yellow Storage in Southend is NOT on fire. We’re slowing down to double-check our info before posting more on Eltham and Lewisham. 2229: Picture below of Eltham is of a flare, not a bomb – Lewisham appears to be quiet despite large group of people reported there earlier. 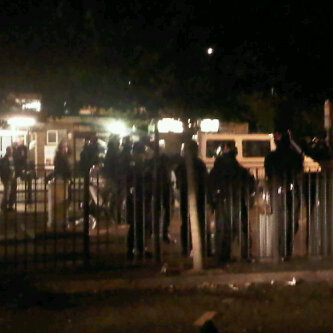 2225: Riot vans going through Deptford towards Lewisham. Meanwhile in Leicester helicopters are assisting police on the ground over there. Some damage on Granby Street, apparently. 2223: Rumours of fire in Basildon appear to be false. 2220: Lewisham seems to be quiet according to locals there – perhaps the bulk of the people round there have moved towards Eltham. Confirming. 2216: LBC radio are reporting around 2000 people moving from Eltham to Lewisham to “reclaim the streets”. Developing – updates to @gazthejourno and @thewestlondoner on Twitter please. 2214: Six arrests in Liverpool from earlier, city now quiet. Nothing much happening in Portsmouth after the fire in that derelict nightclub either. 2213: Canning Circus police station in Nottinghamshire firebombed by 30-40 men, report Notts Police. 2211: Reports coming in that 400+ people are running through Lewisham, from a source on the ground. Confirming now – that’s very recent. 2208: Met Police confirms disturbances in Canning Town, Crouch End, Muswell Hill and Highgate. 2205: Gang of youths reported to be on the rampage in Milton Keynes. 2204: 20 police officers on guard outside Bletchey train station, reports the Milton Keynes Citizen. 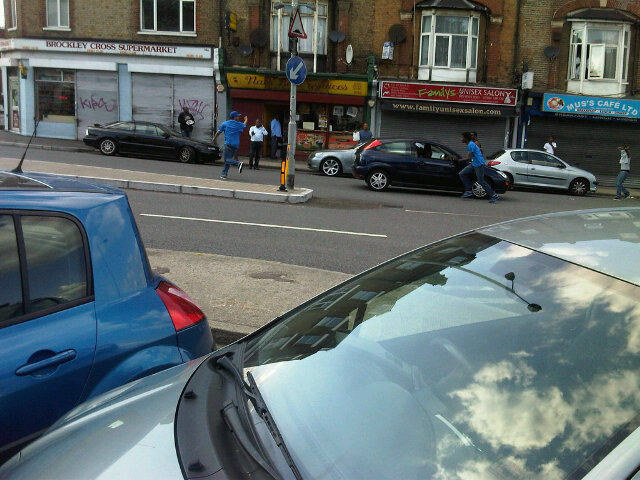 2203: Curry’s in Ruislip was hit earlier – pic found on Lockerz.com. Thanks to Peter Smallwood for digging that out for us. 2200: Harrow is all quiet, our man there reports that pubs are serving beer as normal. 2159: Restarted my browser, that’s cleared up the slowness. Reports of a fire in Burnt Oak are coming in thick and fast. Low-quality pictures coming in. 2153: Road closures reported in Birmingham. Unconfirmed reports of something happening on the A127 in Southend – looking into that now. 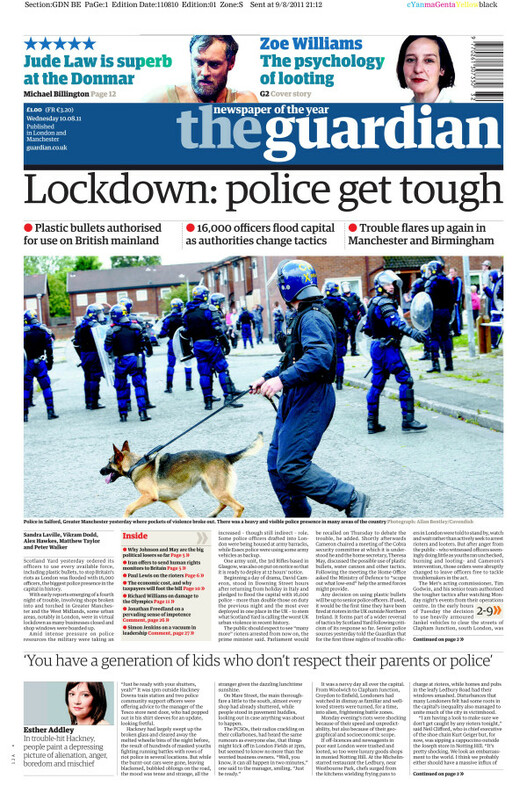 2152: Reports of water cannon leaving Northern Ireland and the Guardian’s front page for tomorrow reports that plastic bullets have been authorised for use on the UK mainland by David Cameron. 2148: Lots of reports coming in that Eltham has become a popular spot. Police attending the scene there. 2143: Cotton Street in Poplar is closed due to a public disorder incident. More as we get it. 2143: Southbury Rail Station, near Enfield, has just closed. 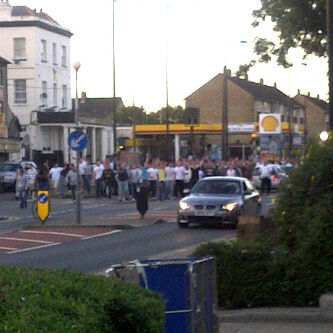 2139: This picture is apparently of Millwall fans in Eltham earlier. My laptop is going slow – back in a couple of minutes. 2134: Four people reported to have been arrested in Bletchley. 2132: Fabric World in Bletchley is reportedly on fire. Meanwhile the groups of people out on the street may be about to clash with each other. Trying hard not to use any emotive words to describe these groups – wary of stoking tension. 2131: Unconfirmed rumours of something happening in Bletchley town, Milton Keynes area. 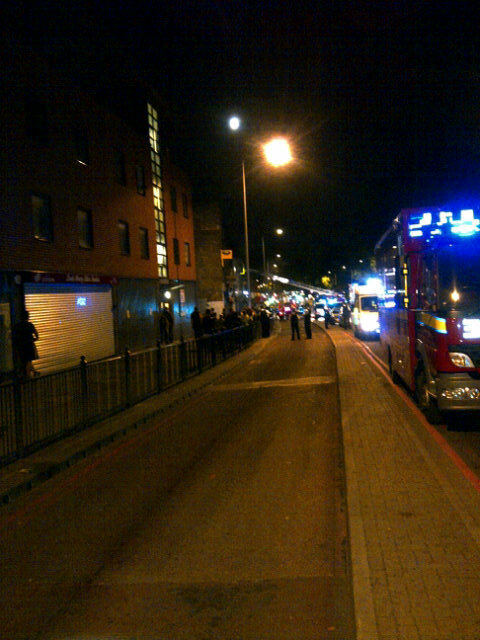 2127: Rumours of a fire in Wandsworth that was caused by a kitchen accident – not riot related. 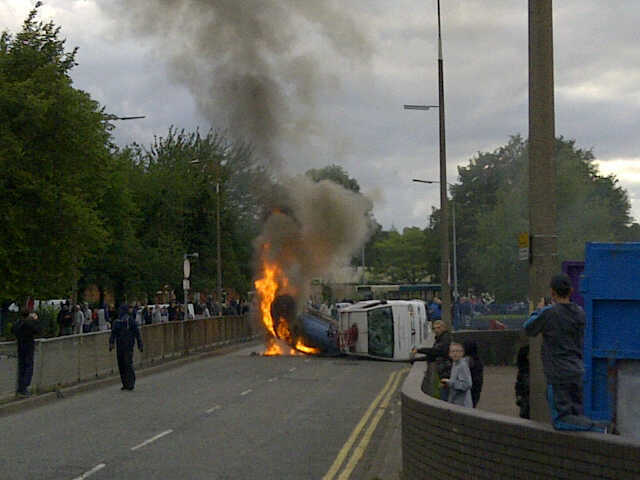 2125: Confirmed reports of a car on fire in Dagenham and youths gathering in the area. 2122: Police in Wembley report no incidents there, it’s all calm across NW London. 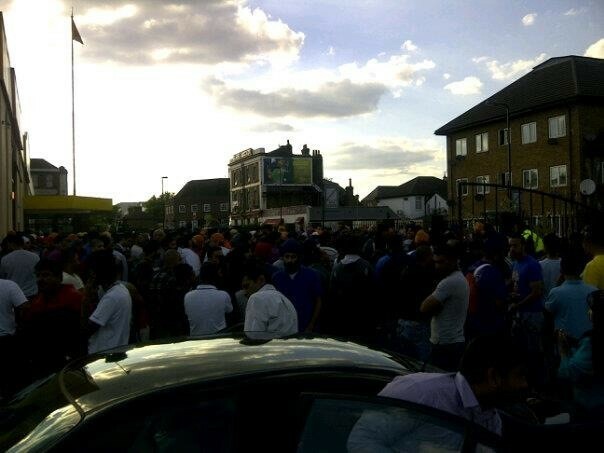 Meanwhile reports that more people are gathering in Enfield and Southall. 2120: Local people are now on the streets in Eltham, Enfield and New Addington. 2117: Reports from Eltham (London) that cars of people are driving around randomly attacking passers-by. Stay away from the area if you can. 2115: Sky News people on the ground in Manchester reporting that police are confiscating petrol bombs. Worrying news. 2108: People in Mitcham are being told to go home by police. 2107: News just in that National Express coaches will make their final departures from Birmingham, West Bromwich, Wolverhampton and Dudley at 9.30pm. 2104: A fire has occurred in West Drayton but it is definitely not linked to the riots. 2102: Mitcham, Tooting and Wandsworth all quiet, no futher disturbances. Unconfirmed reports of youths at a petrol station in Wembley now. 2101: LBC reporting that Apple have emptied their stores nationwide in case of looters. 2059: Reports of trouble in Wembley, London. Looking to confirm. 2056: Bristol reports heavy police presence but no trouble as yet. 2055: Manchester Metrolink has been suspended – there is no service there at all. 2051: Police in Dagenham have made an arrest. Romford police are still moving troublemakers towards the marketplace. 2051: Piccadilly Gardens in Manchester has been cordoned off apparently. Checking now. 2050: Nottingham seems fine after slight unrest yesterday but both football teams there are playing apparently. Potential for problems? 2047: New reports from Nottingham. Standing by to confirm there. Will have a look at London again in a moment. Maybe we should rename ourselves “The UK’er”? 2045: Liverpool is quiet now. Reports that Portsmouth is still tense but quiet. 2040: Shepherd’s Bush is nice and quiet. 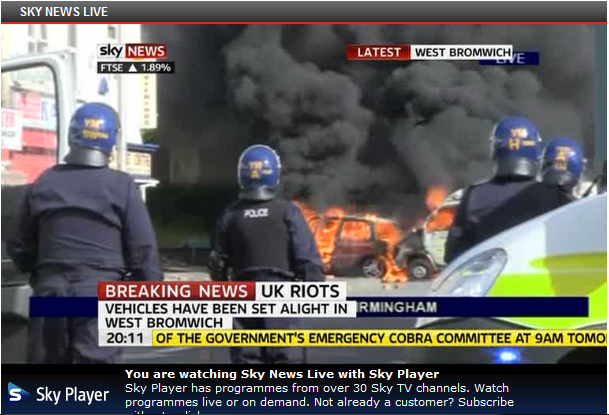 Meanwhile Birmingham riots are apparently moving north in the city. No further updates from Manchester. 2035: Group of people we reported in Enfield earlier are apparently a multi-ethnic group with no beef against any particular group. Happy to correct the record. 2029: Tons of updates coming in. Five riot vans in Hertford Road, Enfield. 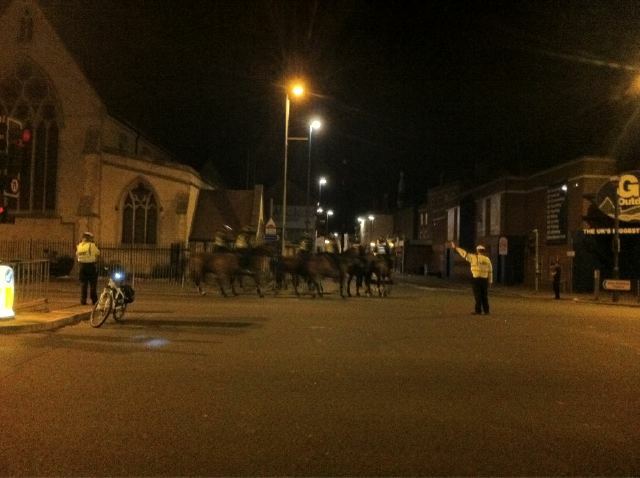 Shops are being raided in Manchester but police mounted units, aided by dogs, are getting the situation under control. 2026: Reports coming in from Milton Keynes of trouble there. Confirming now – police helicopter supposedly in area. 2024: Enfield vigilantes (50-60 or so) reportedly gathering in Church Street. 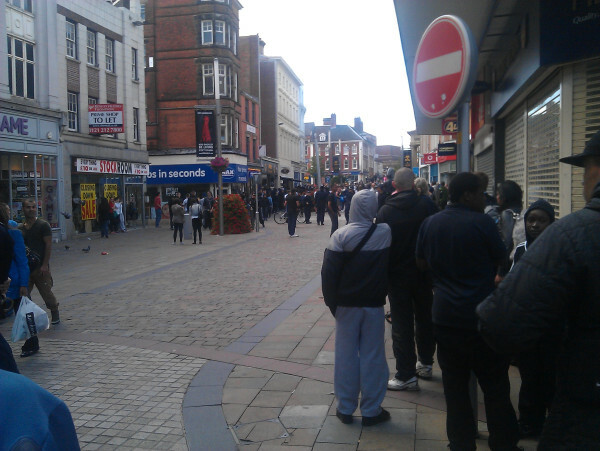 People are cheering police in Enfield Town. They are gathering to stop rioters, according to our source on the ground. 2020: Police have charged with riot batons drawn in Manchester. 2019: Riot police in St Anne’s Square, Manchester, are arresting all looters and rioters there. Buses are being diverted away from Central Parade and New Addington. 2017: Fifty thousand per cent (50,000%) increase in sales of batons and similar on Amazon. 2016: New Addington in Croydon reports about a hundred people there. Apparently they may be locals. 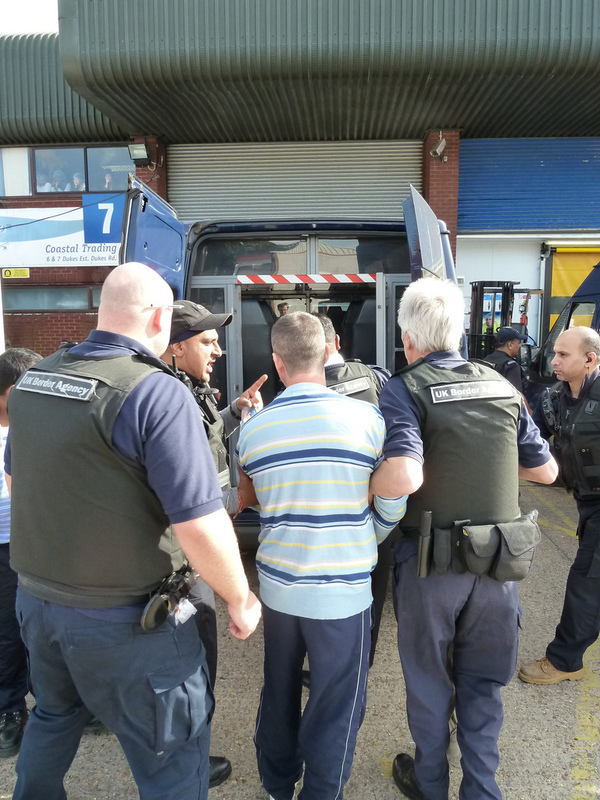 2015: Number of arrests made in Canning Town. Lots of new reports from Croydon, combing through those now. 2012: Portsmorth is tense, according to our man on the ground there. Lots of cars driving around and a decent police presence but nothing actually happening just yet. 2006: Reports from Manchester that hotels have been told to lock their doors. Confirming. We’re expanding coverage to the wider UK. 2004: This just in from Eltham, lots of people gathering at local pubs. 2001: Lots of stop-and-searches being reported in Canning Town now. Police definitely in control there now. 1959: Smoke over Canning town is almost definitely just drifting over from the burnt-down Sony centre in Enfield. Things there appear to have subsided for now. 1956: Canning Town seems to be calming down now. 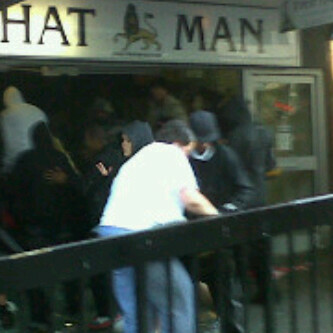 Groups of men have reportedly gathered in pubs in Eltham and are waiting for looters to show up. 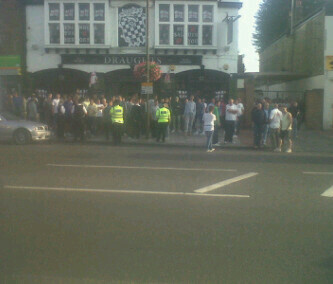 Apparently Millwall fans are patrolling the area, looking for confirmation there. 1953: Oxford Street is empty. Various updates from West London saying that nothing is happening. Looks like either the police are getting to grips with the situation and tackling rioters as they start, or the rioters have finally given up. Mounted police are assembling in Canning Town. 1949: Large group of people reportedly on Hertford Road in Enfield chasing away troublemakers. Rumours of racist chants coming in from there. 1946: Reports coming in of arsonists operating in Aston, near Birmingham. Confirming. 1943: Police carriers reportedly speeding through Hanwell, West London. Meanwhile this came in a few minutes ago from Salford. 1938: Canning Town locals are reportedly fighting back against looters. 1937: Police are moving troublemakers in Romford towards the marketplace there. Potential kettle? 1935: Reports coming in from Southsea that trouble has flared. Youth groups being dismissed. 1934: Curry’s on Oxford Street a few minutes ago. Rumours of police arrests there now. 1931: Riot police are out on Oxford Street, reportedly. 1928: Cars are apparently on fire in Wolverhampton. Not confirmed, lots of people asking what’s happened there. 1925: Canning Town latest picture – lockerz.com external link. 1924: Bus fire reports in Canning Town are seriously mixed – some say it is, some say it isn’t. LBC are now saying it’s unconfirmed, apparently. We’re holding back on reports of that until we get something concrete – pics to @thewestlondoner if you’re on the ground. 1922: Police radio overheard reporting that 20+ masked youths are gathering on Oxford Street. Judging by the fact that it’s on the police radio I’d think that that’ll be dealt with swiftly. 1921: Greater Manchester Police are asking people to stay away from the city centre there. 1919: Canning Town latest: Prince Regent DLR station has been attacked and a bus is definitely on fire according to eyewitnesses. 1917: BBC News showing live footage from Croydon now. Resembles the aftermath of a WW2 bombing raid. 1914: Canning Town bins are smoking heavily, that appears to be mixing with smoke drifting from Enfield Sony centre. Acton is quiet. In Manchester Miss Selfridge’s is reportedly ablaze. 1907: Press Association reporting that windows in Sloane Square have been smashed. 1906: Canning Town a couple of minutes ago. 1903: Three helicopters over Canning Town according to LBC. Likely to be BBC, Sky and police. 1901: Crouch End Blockbuster’s was apparently damaged last night – whoops! It’s calm there now. 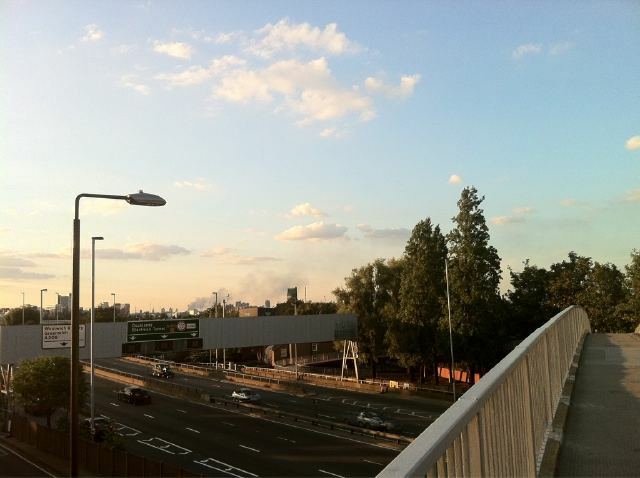 Smoke over Canning Town is blowing across from the smouldering Sony distribution centre in Enfield Lock. 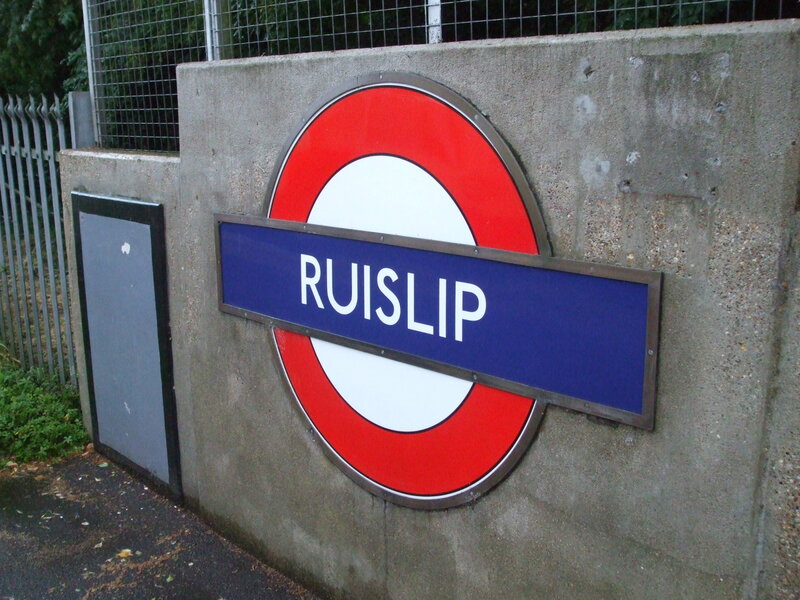 No news from Ruislip. 1857: Mixed messages from Crouch End – unconfirmed reports of something happening to the Blockbusters there. Canning Town has a bus on fire, Sky News are showing footage. Meanwhile the BBC are broadcasting the weather. 1856: Deputy Mayor of London, Richard Barnes, is reportedly in Uxbridge talking to police. No violence reported there but rumours coming in about Ruislip and Northolt. We’re confirming. 1854: Update on Southsea fire from earlier – that appears to have been an arson attack on a derelict nightclub. Not connected to rioting. 1850: Brixton just now. 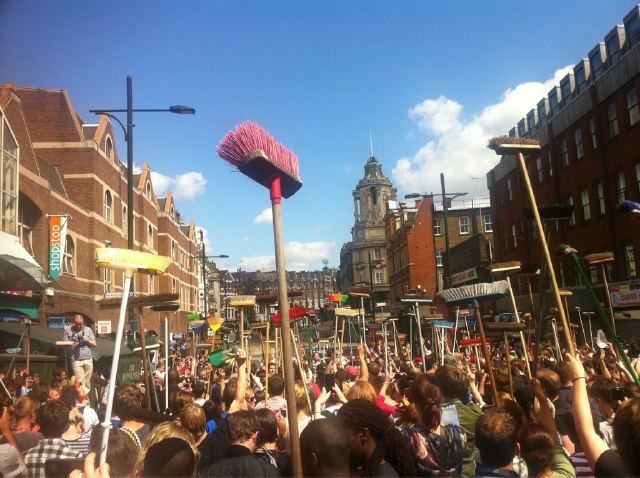 No violence, just local people gathering to clear up the mess from the last few nights. 1848: Brockley Cross, SE4, at 1830ish. Near Lewisham. 1845: Wakering Road in Barking reports trouble. Everything seems to have exploded – rumours of other towns around London experiencing trouble. 1842: BBC showing footage of West gangs pushing over vans and bins. 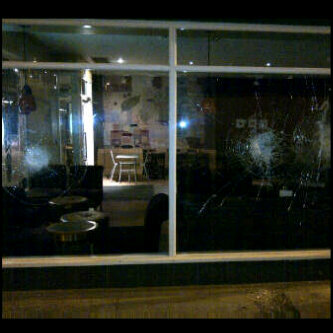 Shops being smashed as well. 1841: London Fire Brigade have confirmed that bins are on fire in Canning Town. 1839: LBC reporting a bus on fire in Canning Town. Helicopters are apparently in the area. Checking this now. 1833: Harrow, various reports that gangs of muggers are on the loose and hanging around train stations. 1831: Freemasons Road in Canning Town is closed, the Met Police are reporting that there are disturbances between the A13 and Victoria Dock Road. 1829: Ponders End seems to have gone quiet. There were reports from there that the Tesco’s was on fire but we can’t confirm this. 1828: Leyton High Street shops have closed early. No further reports from there as yet. 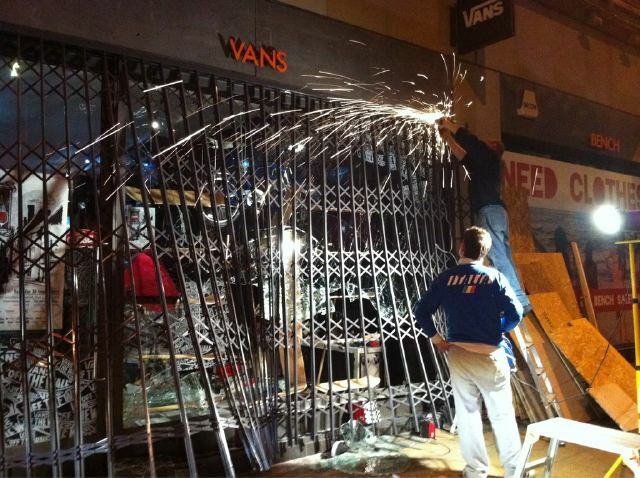 1825: Rioters have smashed the doors of JD Sports in the Victoria Centre in Nottingham. 1823: Ken Livingstone is calling for a curfew and for the events of the last few days to be officially declared a riot. This means police would have to reimburse people for the damages they’ve suffered, if I’ve understood it correctly. 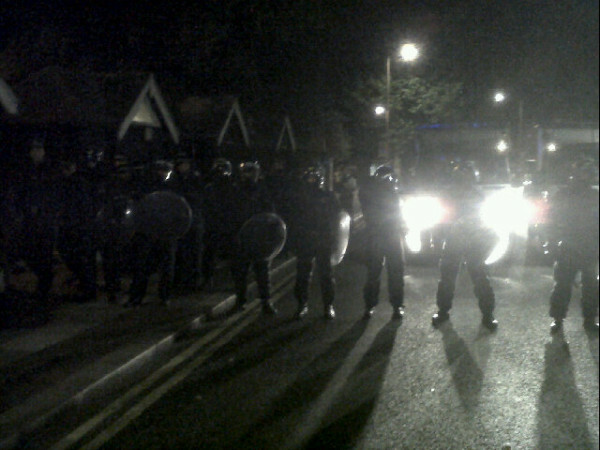 1820: Apparently Ealing residents are banding together to protect their property this evening. Picture of a flyer being pushed through people’s doors has been seen but we won’t reproduce it. 1819: Unconfirmed rumour that Toys’R’Us in Hayes is on fire. Seems unlikely, confirming that now. 1817: Car on fire in Barnet but unrelated to rioters – apparently the engine overheated. Bad luck. 1814: East Ham High Street has heavy police presence – no looting or rioting reported there just yet. 1811: Met police reporting that 111 police and 5 dogs have been injured over the last three days. 1806: Amazon reporting that sales of steel baseball bats are up by 6,000% (six thousand per cent, not a typo) . 1803: Jubilee Line suspended between Willesden Green and Wembley Park with a signal failure. Nothing to do with riots, just the usual creaky LUL infrastructure! 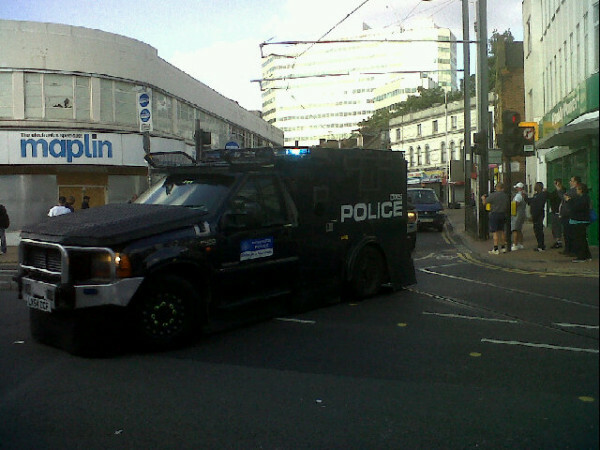 1801: Large column of police Guardian armoured vehicles going into Croydon now, coming out of Croydon bus station. Pic via Guardian’s Matthew Taylor. 1800: Back streets of Hayes and West Drayton are niec and quiet, apparently. 1759: PC World and Curry’s in Croydon have been boarded up. Curry’s has been a target for the last few nights, seems like a sensible move by the management. 1756: BBC reporting shops looted in Salford. 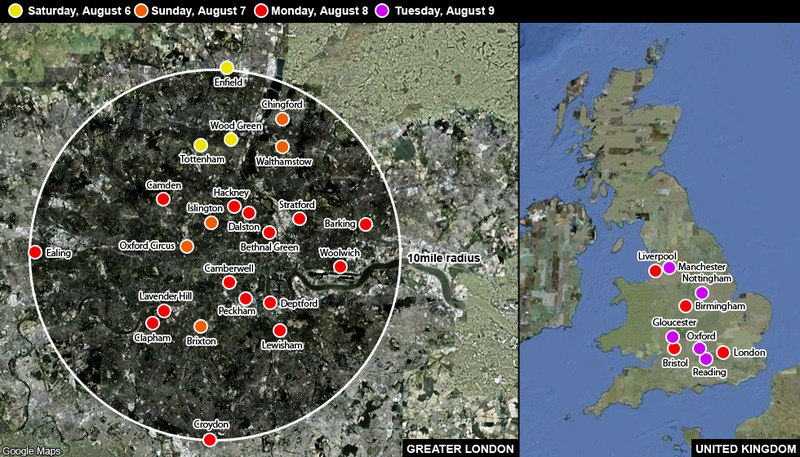 1754: MAP: from CNN, the disturbances across London and the UK so far. 1753: 20 police officers reported outside Hackney station. Croydon Council is meeting with police now. 1748: Canary Wharf tube station appears to be closed. Nothing on TfL live map. 1747: Armoured police vehicles have travelled through Brixton and Streatham and are now heading towards Norbury. Checking to see if there are any reports of violence there. 1747: Shops in Harrow Weald are closing now. 1746: Croydon businesses are closing and boarding up. Fire brigade attending the scene, apparently. 1745: Definitely something going on in Croydon. Reports of rioters present there and a car has definitely been damaged. Confirming that it is fire. 1743: Greater Manchester Police reporting that rumours of disturbances there are false. Not confirmed. 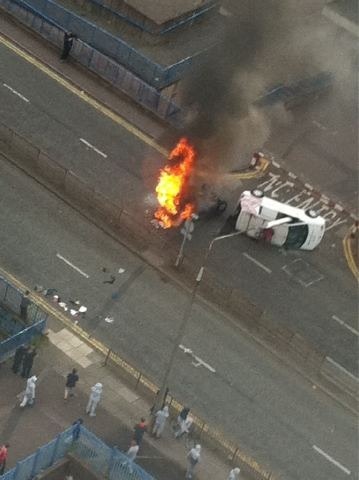 1741: Reports on LBC of a car on fire in Croydon. Confirming, this seems concrete. 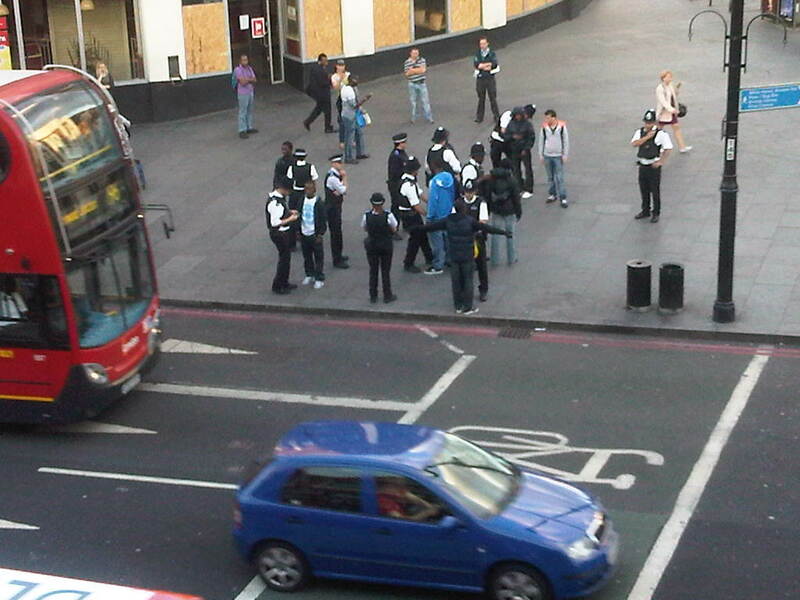 1738: Police outside Westfield. Nothing happening there. Atmosphere everywhere seems to be tense and expectant. 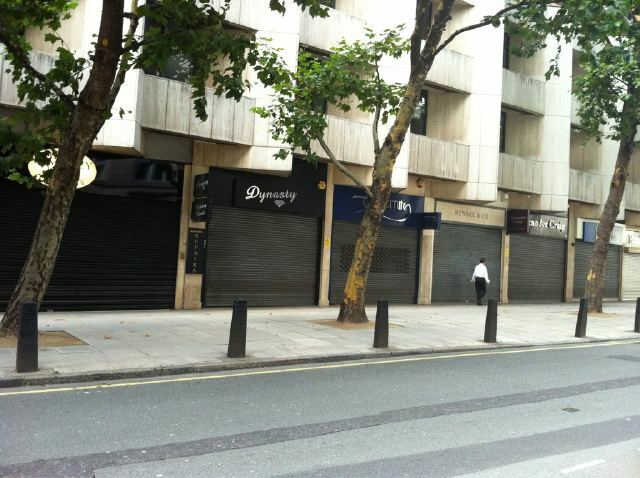 Many people have closed their businesses early. 1736: Lots of rumours but no concrete reports of violence from anywhere. BBC News reporting disturbances in West Bromwich and Sky News reporting disorder in Wolverhampton. 17:29 Eltham shops are now closed. Police presence remains in the area. 1728: No major incidents occuring within London, heavy police presence seems to be working. 1721: Uxbridge has begun closing, with shops shutting down early. Pubs appear to be remaining open. 1719: Unconfirmed reports of a vigilante group received. Will update and confirm/deny as we hear it. 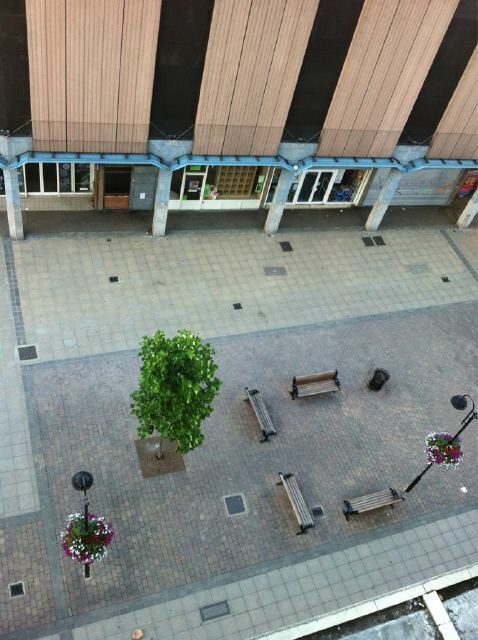 1714: Hayes Town Centre closed off. More updates as we get them. 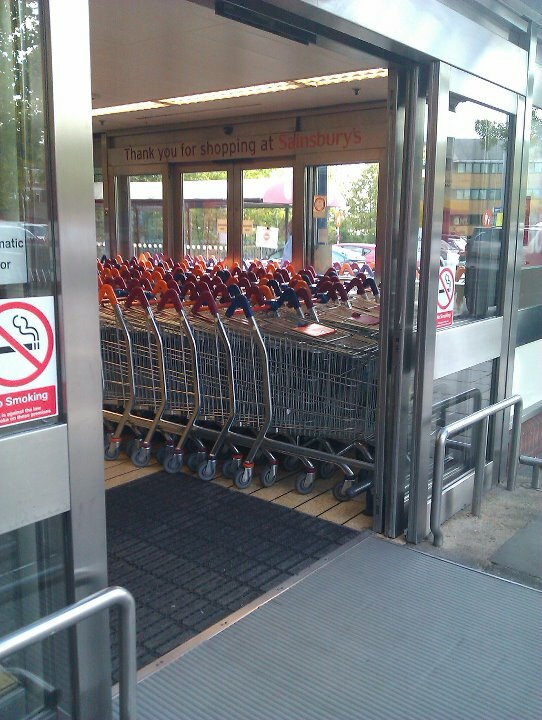 1710: Photos of Uxbridge Sainsbury’s from our guy on the ground. They’ve pulled in all trolleys into the foyer. 1709: Twelve police vans, including armoured vehicles, seen heading towards Clapham from Brixton. 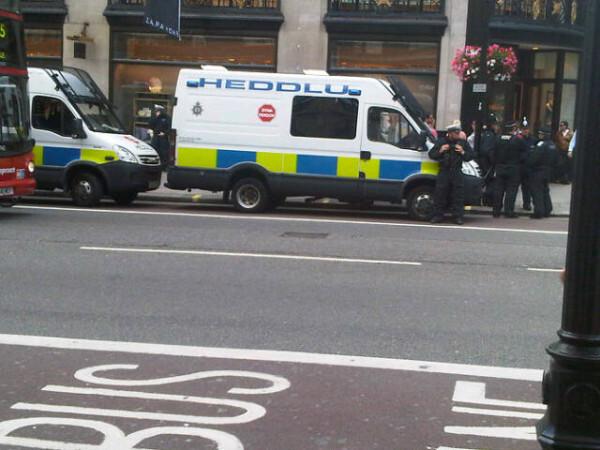 1707: Welsh Police are present in the city as part of the 30 forces supporting the Met Police. 1704: BlackBerry Messenger not suspending, but RIM are assisting police. Despite claims for local MPS, there has been no requests from the Home Office to shut down the service. 1701: Local religious residents in Uxbridge have taken to the street. 1658: West Norwood Cemetery has been closed due to fears of rioters defiling the graves. 1656: London fringe theatres are reported to be cancelling shows amidst the riot fears. 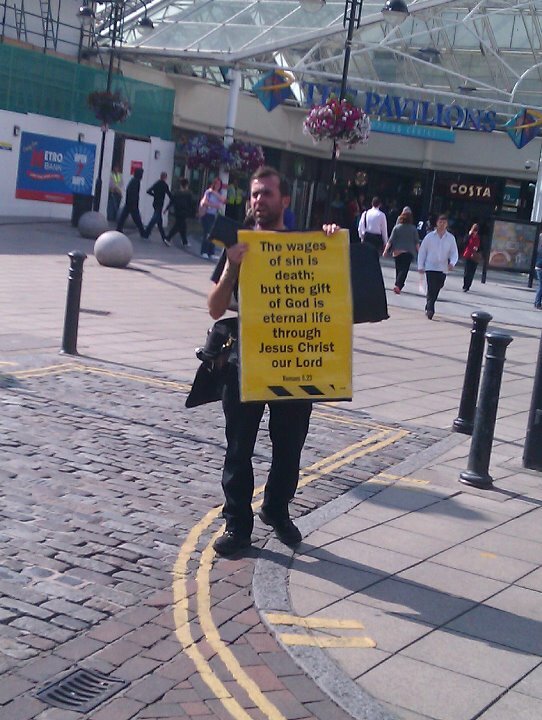 1652: Wolverhampton beginning to heat up with groups seen walking the streets. 1646: Appliances Online (who sell washing machines etc.) 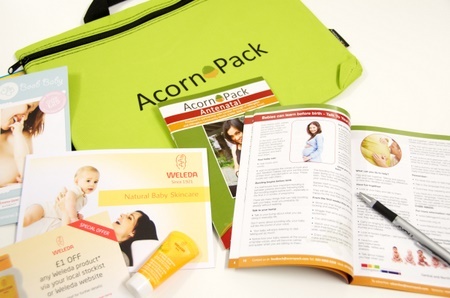 are sponsoring tonight’s post because they think our work deserves recognition. Which is nice of them – it’ll keep a roof over my head for a couple of weeks! 1644: Tulse Hill High Road is closing. Police presence in the area. Lots of rumours of communities being targeted but were not reporting anything unless it actually happens. 1639: Tulse Hill shops closing now. 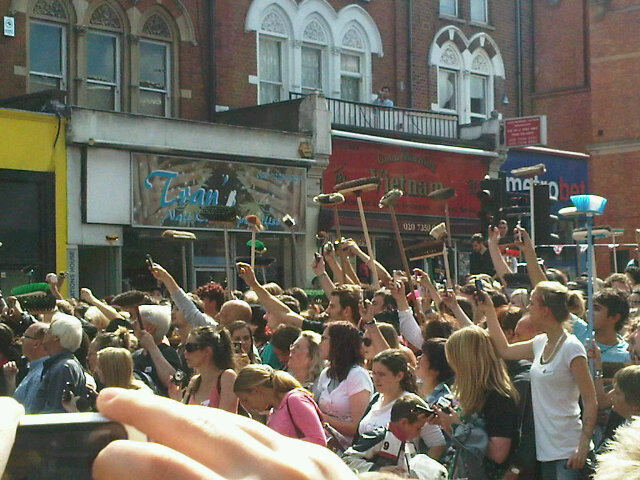 Earlier reports that Boris Johnson is out with a broom in Clapham. 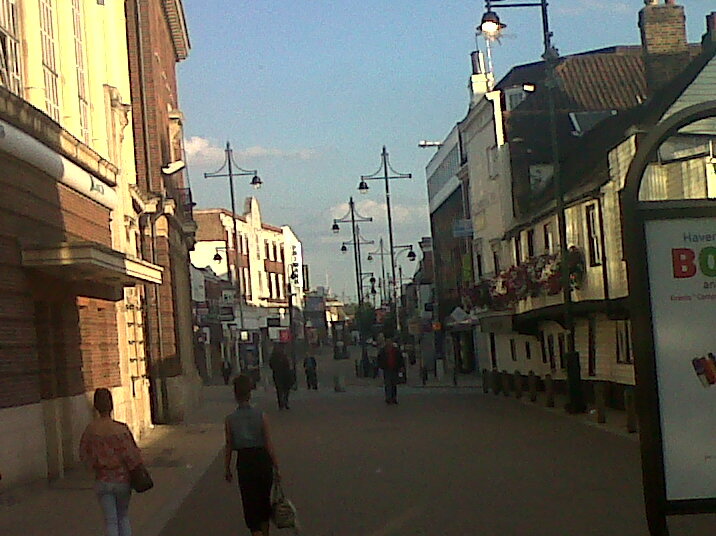 1636: Uploading pictures of business as normal in Uxbridge. All reports from other areas of London seem to indicate heavy police presence but not much in the way of violence. 1634: Gaz Corfield here now. Just got back in from Uxbridge and I can confirm personally that the town is quiet. Uxbridge London Underground station is open for business. Police presence heavy for the area but atmosphere is expectant. 1624: Shops closing in Chislehurst and Paddington. 1623: Gangs spotted in Dagenham but the police ‘have it under control’. More updates soon. 1619: New reports suggest Morden shops are being told to close. 1613: Welling, Eltham and Sidcup add to the list of towns who have shut up shops. 1611: Dalston closing up for the night. 1608: Police seem to have many locations under control, and no reports yet of major breakages. 1605: We’ve received reports that trains are not stopping in West Norwood. 1602: Update on Rose Hill, near Sutton. 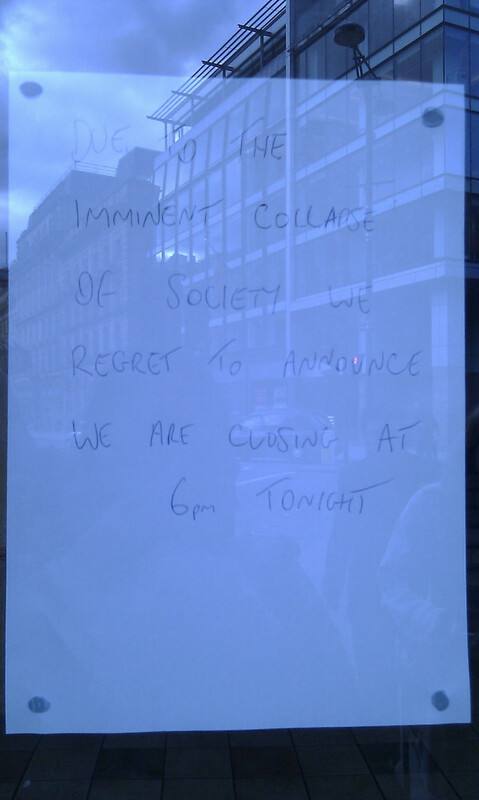 Co-Op is fine, but had high police presence earlier today which raised suspicions. 1600: Reports of smashed Phones4U and high police presence in Putney visibly reduced. 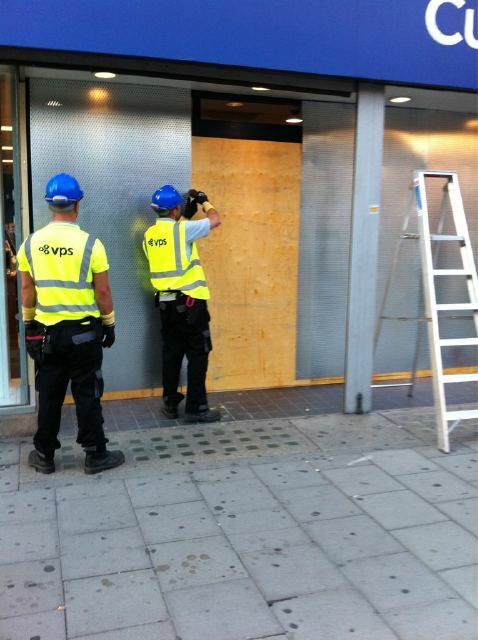 1556: Latest images from Balham of shopkeepers boarding windows. 1555: New reports of shops closing in Purley. Also unconfirmed reports of trouble in Dagenham. Any information, please send to @TheWestLondoner. 1553: Train service between Gatwick Airport and Three Bridges running as usual. 1552: Greenwich shops and university have been closed. 1550: AUDIO: two women who claim this is “showing the rich people we can do what we want“. 1545: Arrests in Wolverhamption, and now polcie seem to have calmed the area. 1541: No news from Collier’s Wood or Mitcham, despite disturbances around the Rose Hill Area. 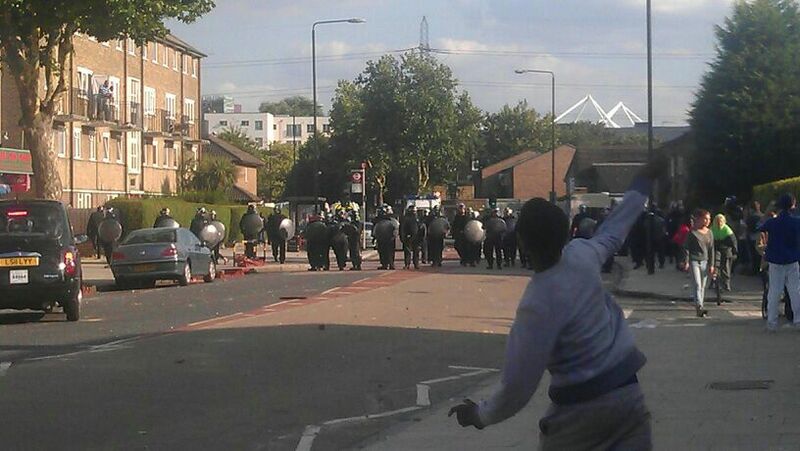 1540: The large police presence in Wimbledon appears to have deterred rioters so far. 1539: Brunel University in Uxbridge have closed their Student Union offices and bars. 1537: Southside shopping centre in Wandsworth closed. 1535: Association of Chief Police Officers say there are now 30 forces supporting the Metropolitan Police. 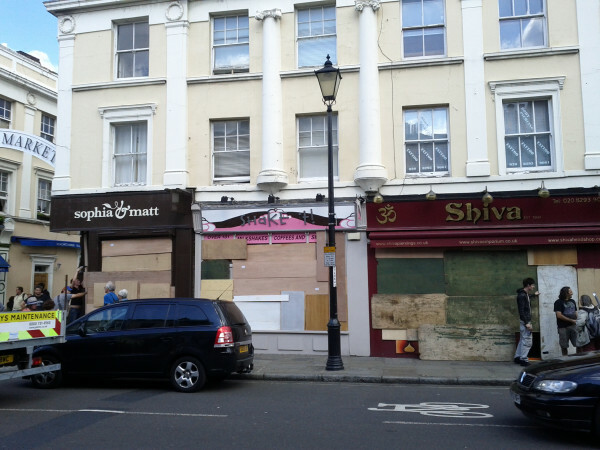 1533: Greenwich have boarded shops across the town. 1530: Reports of Rose Hill, near Sutton and the Co-op has been hit by looters. 1524: TFL say they won’t be closing stations ealy. 1521: No major updates of yet. Monitoring situations in Wimbledon, Putney and Croydon. 1516: Collier’s Wood Sainsbury’s is reportedly being evacuated and closed in precaution. 1514: Reports suggest there is a presence in Plumstead. 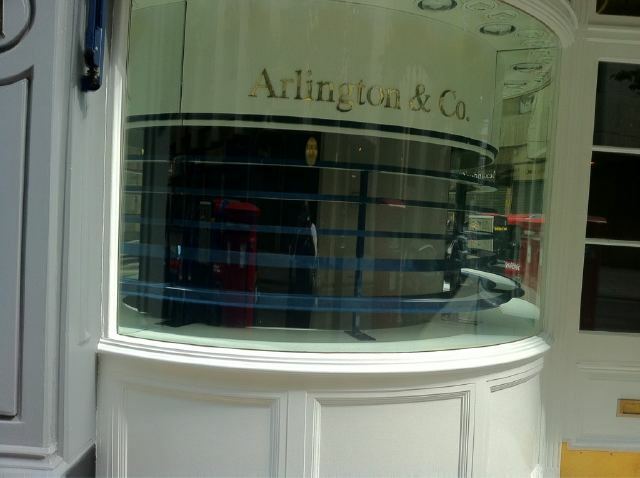 1512: Confirmed that now the majority of both shops and offices in Wimbledon are now closed. 1503: Police warn of gangs beginning to congregate around South Westminster. Elsewhere, there is a police presence in Egham, near Staines. A local BP garage has been boarded up. 1500: No major devlopments so far, seems like police presence and shops closing are all mainl precautionary. We’ll give you information as soon as wel get it. 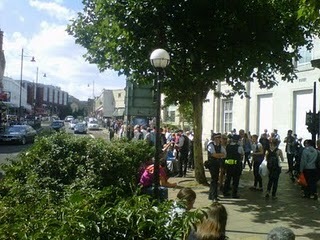 1455: Confirmed reports that shops are closing in Putney. Please send any information about riots, or pictures from the scenes to @TheWestLondoner and we can help keep you updated. 1452: Police presence building in Putney as a precaution of rumours for tonight’s ‘hits’. 1451: Bermondsey also reported to be quiet, although rumours that Wimbledon Village is seeing rioters. 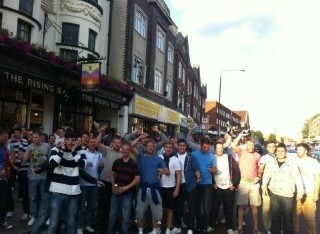 1448: Putney and Richmond ‘safe’ amongst rumours that rioters are in town. 1446: Reports of a bin on fire in Wimbledon. Nothing large-scale just yet. 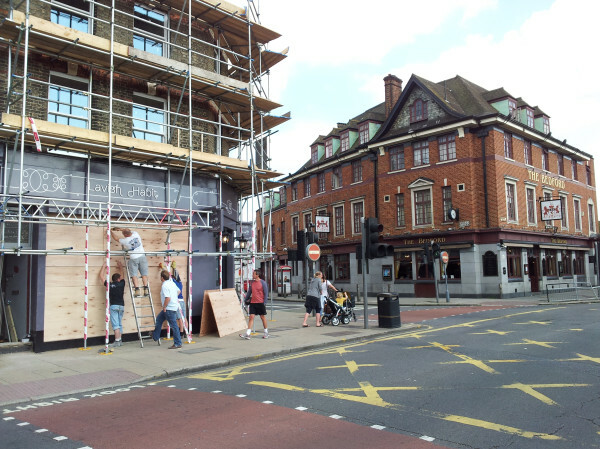 1442: Shops in Wimbledon are reportedly being boarded up by locals and police. The station remains open for the time being. 1437: 16,000 police to be in London this evening. 1434: Many shops in Wimbledon closing, but the station is remaining open for now. 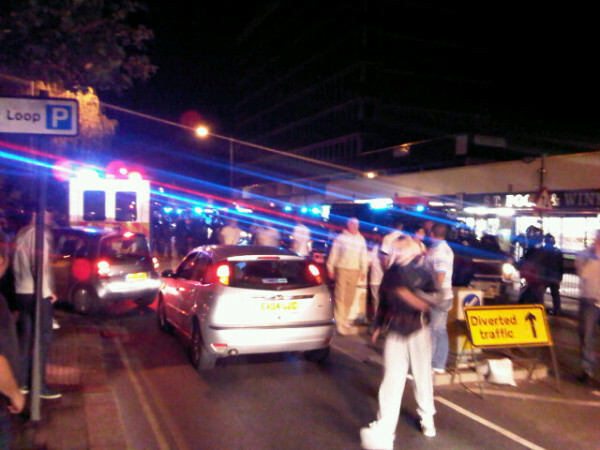 1427: News that the man who was shot in Croydon last night has died in hospital. 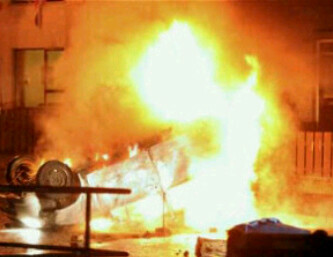 And so another night of riots, this time target a more southern area. The West Londoner were again reporting through the night, with people on the ground and others harvesting news from around the capital. The locations hit since 15:00[GMT+1] showed that groups were moving south, and got down as far as Collier’s Wood and Sutton. We will be keeping you updated on any news as we get it.